Our contribution for the brand new event „Whimsical“ (opening 18th February): The Asian Pathways Building Set. The modules are laied out that every possible combination of pathways can be built. The Pathway Set contains the Landpart, the Arch Bridge, the I-Part, the T-Part, the X-Part and the Corner Part. Also available is the Stilted Gazebo which can be used for the Pathways but also as stand alone piece. 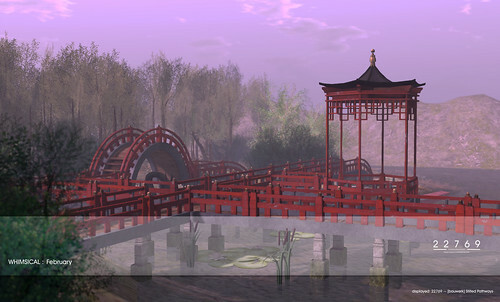 The Set is completed by the decoration set containing water lotus flowers, cattails, a Fu Dog Statue and a Water Dragon Statue. Of course there is also a complete set available at Whimsical. All pieces are 25% reduced during the event.